Believe it or not, this is a photo of my belly. Yes I know it is not the best looking thing on the face of the planet, but there is a reason I'm posting it here. What you are looking at is my Belly button (the dark indention on the left-hand-side) and a cross-section of a scar that runs from my sternum to my pubic bone. It is this scar that is a reflection of what is causing my incisional hernia (Yes my intestines are peaking through my abdominal wall). For the last part of my cancer treatment they had to open me up to get at some lymph nodes at the backside of my abdomen. When they finished they sewed me back up and stapled me back together. 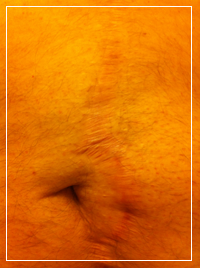 Because they had to cut straight through my abdominal muscles, they left that area weaker that it would naturally be. I may have actually had this hernia for a while, but my belly fat may have kept it in check. Well I started running this past May and because I've been getting healthier, that fat has been going away, but unfortunately it let my Intestines sneak through a thinned out abdominal wall. So while I'm probably healthier now that I have been for the past 20 years, i am in serious need of surgery. So, on November 6th, I will check into the hospital and have some mesh sutured into my abdominal wall and work on getting better. I am running my last big race for a while this Saturday 10/27. I am participating in my first Quarter Marathon here in Huntsville. I will continue to do evening up until the night of November 5th. I will be updating the family site with all the important details.